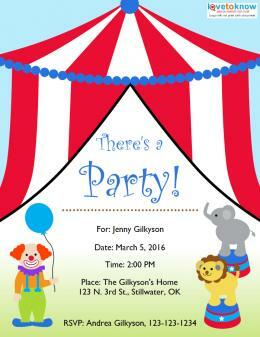 A circus theme party is a perfect spring party theme for kids and a great choice for a child's birthday party. Whatever the reason for hosting the event, children of all ages will have a blast at a big-top bash. Setting the stage is important when hosting a circus theme party. Transforming a backyard or living room into a circus arena makes party decorating the biggest headache for many hosts. Use a little ingenuity to bring the big-top home. Fly high with us as Sarah turns a daring 3 years old today! The Smith Family Circus arrives on June 3 to celebrate Jason's preschool graduation. No clowning around, this party is going to blow the tent away! Step right up, ladies and gents, to see the amazing Katie blow out her candles on August 15! No circus is complete without the animals. Arrange multi-colored stepstools around the party area. Tie a few balloons onto the back of each. Put stuffed animals, like elephants, tigers, lions and monkeys, on top of the stools. Hula-hoops or round sleds can form the "rings" for each animal. Pets can make great "roaming" circus animals. Add a clown ruffle to the household dog or cat's collar, letting it in on the fun. Try it out a few days beforehand, to let the pet get used to the feel of the new clownish collar. Parties held outdoors can get large tents from party supply rental stores. Although they may send a party budget soaring, rental tents will provide a safe place from wind, rain and sun with little fuss. Recreate the look of a tent indoors by hanging red, yellow, blue and orange streamers from mid-ceiling to the outer walls. Twist the streamers before fixing them to the opposite wall, leaving a small swag down the middle. Do the colors in groups of five same-colored streamers at a time. Create a small tent using a large cardboard refrigerator box. Paint the sides red and cut a doorway. Unwind wire coat hangers and attach one to each corner and in the center of all four sides, twisting them at the top. Cut primary colored fabric to fit over each area of the roof, using superglue to affix. Trace elephants, tightropes, clowns and tigers onto the inside of the mini-tent to create the look of a circus arena. Serve soda, juice or fresh-squeezed lemonade for drinks. Disposable solid color tableware makes clean-up easy and simple. Set games and activities up to resemble a carnival midway, together in a straight line away from other activities. Remember to include age-specific games that appeal to both young and old if the guests' ages vary. Older kids can handle throwing darts at balloons tacked onto a corkboard, while toddlers will love flipping over carnival rubber duckies in a tub of water. Hiring a clown or magician to be the main entertainment can be a huge hit. Check local talent agencies and amateur clubs to find someone who will perform by the hour. A talented neighbor or relative who has a few tricks up his sleeve or who knows how to make balloon animals can also provide fun, often free, entertainment for all the guests. A circus theme party is perfect for a family, neighborhood or childrens party. Send all the tired guests home with a favor bag that includes circus peanut candy and a bright red clown nose.